Who doesn’t love Cadbury Eggs at Easter time? My favorite are the Cadbury Mini Eggs which are the little solid milk chocolate eggs with a candy coated shell. To me they taste just like M&Ms, but with a malted milk flavor. Also delicious, are the Cadbury Creme Eggs. These are the larger eggs made of a milk chocolate shell filled with yellow and white cream that’s made to look like the white and yolk of an actual egg. Whoever had the idea to mimic albumen with refined sugar is genius! 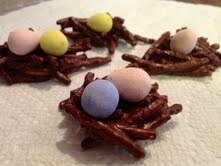 For many Easters now, I have been making these Easter Egg Nest Cookies with the Cadbury Minis. I saw them in a magazine once, you remember, years ago, before Pinterest was invented, when we all read those things called magazines for tips on cooking and crafting. Well, it was there that I got the idea. Basically, these springtime treats are chow mein noodles coated in melted chocolate that are set into clusters and topped with candy eggs. They’re really cute. And really easy to make. I know chow mein & chocolate sounds like a weird combination, but trust me- tastes just like a cookie… from China. This year while a was whipping up a batch, Tide came to me with some new idea of his. I think he’s been watching too much daytime TV while I’m out. 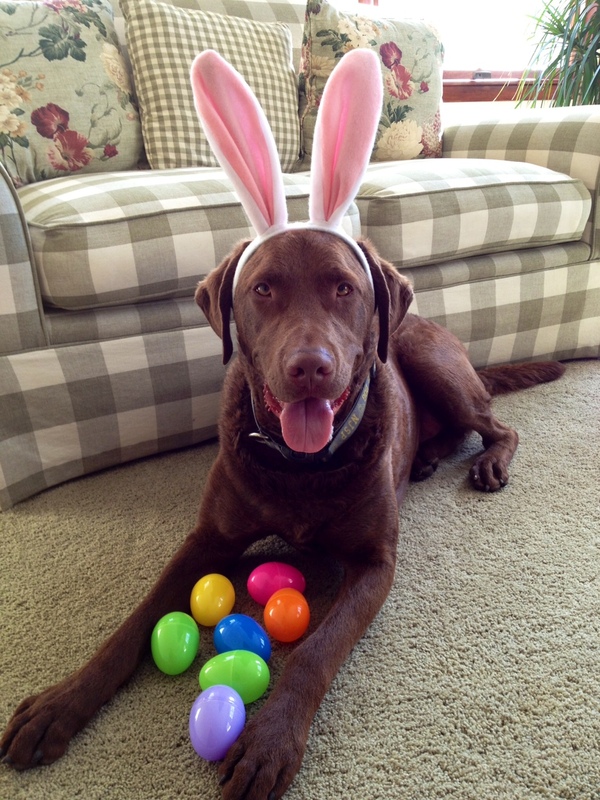 Apparently, he got wind of the Cadbury Bunny Tryouts and now wants to audition to be the next Cadbury Bunny! He saw the cat, the pig, the lion all with those goofy white rabbit ears giving their best attempt to buck… buck…buck. He was insistent on trying out for the commercial himself. I thought it was silly at first, I mean, come on, Tidey on national television? But then I thought, really, what parent can deprive their child of a chance at following their dreams? Who knows- he could be the next e-trade baby with millions of youtube hits… the next teen sensation like Justin Beiber…. posters of him on the walls of every puppy’s doghouse, the next Hollywood A-lister like Lindsey Lohan… all over the tabloids, snortin’ milkbones and getting high on catnip. On that note… LOL… he’s NOT auditioning. I took his picture to appease him but no way I’m mailing it in. Melt the chocolate chips using a double boiler (or melt them in the microwave on LOW stirring about every 30 seconds.) Mix the melted chocolate with the chow mein noodles so they are evenly coated. With clean hands, form cookie-size nests and place them on wax paper. Top each nest with a few eggs. Let set for about an hour or until chocolate hardens.